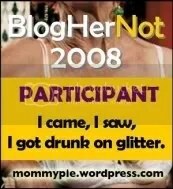 Because I’m not going to BlogHer, I’m going to BlogHerNot. There will be parties, networking and important discussions such as: “How to act interested and then do nothing” by The Preppy Princess, “How to Nail a Psycho YouTube Commenter Against the Wall” by Ms Single Mama, and the all important “Comment Whore How-To” by Steph. More topics that will be covered are found here. That’s MommyPie, for those who don’t know. I don’t know any of the people I just linked, but hey! This is how you make real-online-friends, right? Now…what am I going to write about?